Unlike most flowers, the daffodil , which is categorized under the genus Narcissus, got both its genus name and binomial name in two unrelated ways. The genus name was derived from the Greek God Narcissus. One popular legend says that he was so obsessed with his reflection he would stare at himself in a pool of water all day. One day, he fell in and drowned and the first narcissus flower grew where he died. The binomial name daffodil was derived from the earlier version of the word “affodell”. Eventually, the Dutch were thought to have referred to it as “de affodil”, overtime merging the words together and thus creating daffodil. This genus holds about 50 species, as well as 13,000 hybrid variations. The interesting thing about this flower is how all of them have the same basic features. All daffodils are adorned with a corona (the trumpet shaped center structure) that is encircled by an outer ring of petals. In most cases, the corona is a contrast color to the outer ring of petals, adding bursts of colors to a garden or bouquet. 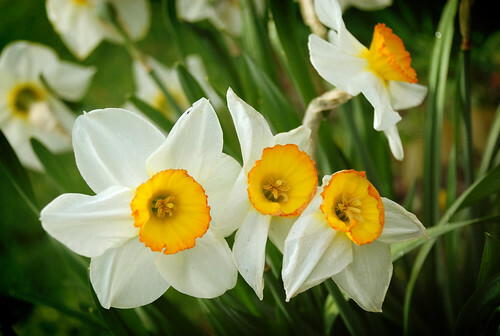 Most of the time, daffodils are found in shades of whites, yellows and gold’s, although they can sporadically be found in pink and lime green hues. Growing daffodils is considered to be moderately easy, as long as the bulbs are of high quality. To be sure they are, check they have no bruises or soft spots. Plant the bulbs in the fall before the first frost so the daffodil bulb can establish roots and be prepared to bloom in spring. Choose a sunny location for the daffodil, though they will still grow in some shade. Soil should be able to drain well and should have lots of nutrients if possible. Plant bulbs 3-6 inches deep and 2-4 inches apart. Make sure the bulb is root side down when placing in the ground. Water daffodils often when they are growing because they drink large amounts of water. Florists like to promote this flower in March, since it is the birthday flower of this month. With daffodils that are in a vase, florists recommend filling it with water only half way because daffodils last longer in shallow water. They also recommend changing their water every 2-3 days.